Don’t worry – this column isn’t about resolutions; resolutions are optional. This is about fundamentals that have served businesses since humans decided to trade with each other instead of taking what we wanted by force. Focusing on these ten fundamentals will help you have the maximum opportunity to find success in 2012. Cash is still King. Managing the relationship between accounts payable and accounts receivable is as essential to survival for your business as breathing is to you. Declare war on excess inventory. Don’t let one piece of inventory spend a night under your roof unless it’s turning or paid for. Convert non-performing assets to cash. What things were worth last year has no bearing on what they’re worth today, and they will be worth less tomorrow. If it’s not being used, cut it loose. Employees spend most of your cash. Ask them to identify ways to find efficiencies and maximize margins. Install these into the new year’s budget and operation. Outsourcing is a best practice. Call a planning meeting and ask this question about every task in your operation: “Must this be done in-house?” Everything that does not directly “touch” a customer is a non-core competency and a candidate for outsourcing. Keep your banker informed about business opportunities AND challenges. The title of the shortest book ever written is “Loan Officer Courage.” An uninformed banker is a scared banker and you’ll never get help from a scared banker. Success burns cash. Prepare a financial projection that anticipates at least 10% growth in sales this year. See how that impacts your cash requirements due to increases in inventory, A/R, etc., and start thinking about how you will fund this growth (see #7, above). If you don’t have a banking relationship with an independent community bank, start one this week This is not a banking alternative – it’s a small business financial fundamental. Every customer and prospect has expectations that are changing faster than ever before. Keep asking what they want and deliver what they say. Remember, you get to decide what you do; customers decide how you do it. 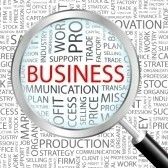 Focus on the fundamentals, plan for success and grow your small business in 2012. I talked more about these 10 business fundamentals today on my radio show. Take a few minutes to download or listen now. It’s 2012 - a brand new year. Will you make any New Year’s resolutions? 67% - Yes - wish me luck. 33% - No - why bother; they never last. The only thing more annoying than people who ask you if you made any New Year Resolutions are people who ask how you’re doing with keeping them. I won’t say my faith in humanity was restored merely by the fact that two-thirds of our respondents said, “Yes, wish me luck.” But it does make one feel better that apparently, hope still springs eternal for most folks. The other third who said, “No, why bother,” represent the pragmatic, or the logical, possibly the fatalistic or, dare I say, dark side of our audience. However hopeful or resigned you are about the New Year, let’s have a good 2012 together. I’ve talked about smart small business resolutions for the new year with several experts in the last couple of weeks. Click here to see our library of podcasts on resolutions and small business goals and listen or download the ones you like. Also, leave us a comment on your business goals for this year.